CCO UV/LED Soak Off Nail Gel Polish Varnish. 89 Colours available! THE EDGE NAILS UV GEL - CLEAR 5g grams False Nail Tips Overlay Builder Using One Step The Edge Nails UV Gels are a professional perfect solution for the UV Gel system. An odourless 3 in 1 self levelling system, which is easy to use allowing the technician more working time before curing under a UV lamp. Therefore this is suitable for the less experienced nail technician. Use the UV Gel for sculpting, overlays or to strengthen the natural nail. A perfect solution for your perfect nails. A smaller 5g pot for the infrequent user or technician The 5 Gram is the weight of the UV Gel Professional Product. Use for sculpting, overlays or to strengthen the natural nail. 1 Bottle Nail Builder UV Gel. Apply the Quick Extension Gel on fingernail tip, cure it under LED lamp for 1-2 minutes. Apply the Quick Extension Gel on whole nail and extend it to desired position, then cure it under LED lamp for about 30 seconds. This Kit contains everything required, except a UV Lamp. The Edge UV Gel kit, the perfect training kit and choice for students or as a starter kit. A one-phase hard UV gel kit, ideal where strong odours are a problem. 1 Pc 30ml Nail Quick Building UV Gel. Apply Extended Gel on nail mould, use nail art pen with Slip Solution to make gel smooth. Put a nail form on your nail and apply a layer of Extended Gel, cure it under UV/LED lamp. 1 Bottle 15ml UR SUGAR Nail Thermal Extension Gel. Curing Tools:UV Lamp or LED Lamp. This nail gel polish is easy to apply and soak off. 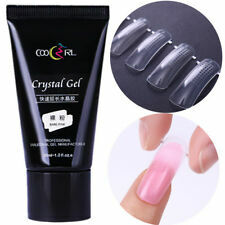 Apply Crystal Building UV Gel on nail mold, use nail art pen with Slip Solution to make gel smooth. THE EDGE NAILS UV GEL - PINK 5g grams False Nail Tips Overlay Builder Using One Step The Edge Nails UV Gels are a professional perfect solution for the UV Gel system. An odourless 3 in 1 self levelling system, which is easy to use allowing the technician more working time before curing under a UV lamp. Therefore this is suitable for the less experienced nail technician. Use the UV Gel for sculpting, overlays or to strengthen the natural nail. A perfect solution for your perfect nails. A smaller 5g pot for the infrequent user or technician The 5 Gram is the weight of the UV Gel Professional Product. Quantity: 2 bottles 1sheet French Manicure Tip. Manicure Tip Size: Approx 6.2cm 6.2cm. 1 Sheet French Manicure Tip. Step 1: Clean Nails then trim nail surface as normal manicure process. Step 6: Apply No Wipe Top Coat and cure under nail lamp again.